Neil Whittington, the owner of world's most beautiful stationery shop "Present & Correct", treats each and every piece of stationery he comes across with respect and dignity. Through his lens every piece looks like a collectible and as you step into his store or click into his instagram, you will be inspired by his passion for stationeries too. 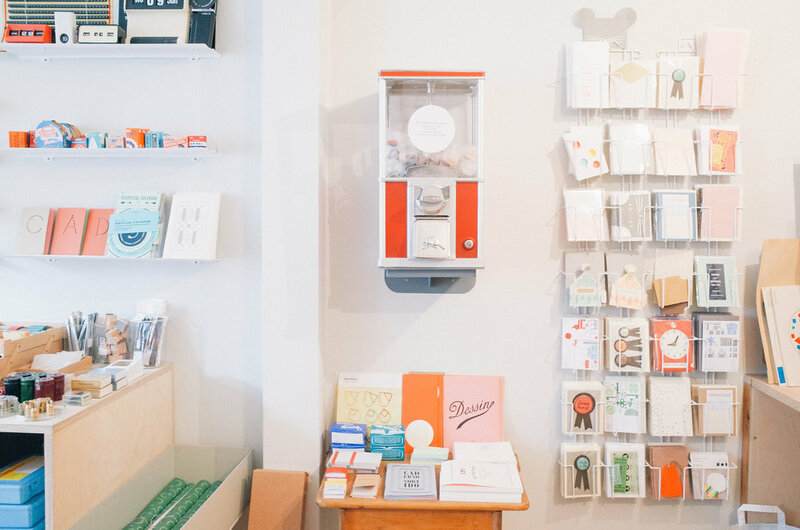 Our interview sheds some light on the reason behind his passion and the recipe for his world-renowned stationery shop, which has gained unparalleled attention over the past 8 years. u: Why did you name the shop "Present & Correct"? P: Present & Correct is an old English saying. It is used in schools when the teacher counts all of the pupils, and if everyone is there they would say 'All Present & Correct'. So I liked it for that reason, also it signifies the idea that everything here is looked after, thought out and as it should be. u: By far what is it about office objects and vintage items that fascinate you most? P: As a graphic designer I am drawn so much to the aesthetic and tactile qualities of nice stationery. When I was a child I just loved new erasers, I never wanted to use them. I couldn't bear to ruin a new notebook with scribbles, I wanted them to stay pristine and pretty. Now, of course, i use these things and love their functionality. And I love the promise that they offer, there are an infinite number of things that could happen to a notebook. u: How did you first get in touch with it? Was it from work or at school? P: I have never consciously decided to like stationery, because I just like it and always have. I did consciously decide to try and make a job with it back in 2009. Definitely school!! I always had a new and interesting pencil case every term, and people thought I was a nerd. And I am, and I'm a proud nerd. u: Apart from your existing designs, which stationary item you want to design and put into production in the future? why? P: I do my best to keep a list of ideas in my diary, things I would like to make in the future. It would be great to design a simple range of branded P&C products. A ruler, an eraser etc. When I was little i loved sets of desktop items that you could buy all together. I am also keen to make another calendar. I am working on a book right now about Czech matchbox labels (matchbloc) and also trying to develop some new leather products. There is also another product coming with the US publisher PA Press. We recently released Mail Box and later in the year there will be some nice paperclips too. u: Which is your favourite piece of stationeries of all time? P: That is the hardest question in the world!! I find vintage things all the time that i love and it is my favourite thing, but then I find something even nicer and love that more! My favourite ever vintage finds have been 1950s french crayons, German geometric rubber stamp sets, Soviet drafting stencils. I think on a very basic, classic level, Post It notes are Iconic!! So clever and also very attractive. Paperclips will always make me happy, there are so many excellent shapes. And erasers, in their simple form (not novelty erasers) are so pleasing with their great colours and shapes. Erasers are like my candy. The list is endless. u: I see you have selected quite a number of designs from Japan, could you share how you feel about the difference between Japanese/ Asian stationery designs and Western stationery designs? P: In Asia stationery is appreciated on a much bigger level, it is more of a cultural, historical appreciation and so naturally that means there has always been a lot more choice and also people understand the joy of stationery. This means designs can be more adventurous, perhaps more niche and also production is cheaper there which means that prices are always very competitive!! In the UK stationery has always been seen as a utilitarian thing, rather than a treat or a luxury. So there has been less variety and I think less fun has been had with it. That is changing now but it is slower. I want people to see that stationery can make your day to day life a bit more enjoyable, as well as being useful. Also now we have a lot more small companies making attractive stationery, so it is not just the high street anymore. This is a good development! u: What is the most enjoyable moment of running Present & Correct? P: There are so many, I have little ones and big ones and some are daily. I was so happy to get a real shop. It was amazing to be on the cover of magazine “Casa Brutus” in Japan. Last year we made an exhibition of Erasers and it was really popular and i was super happy with that. I am happy that after 8 years we still are here! And it is so enjoyable to chat to people in the shop and send orders all over the world, and put little gifts in them when we feel like it and to know that other people understand that a paperclip can be beautiful.